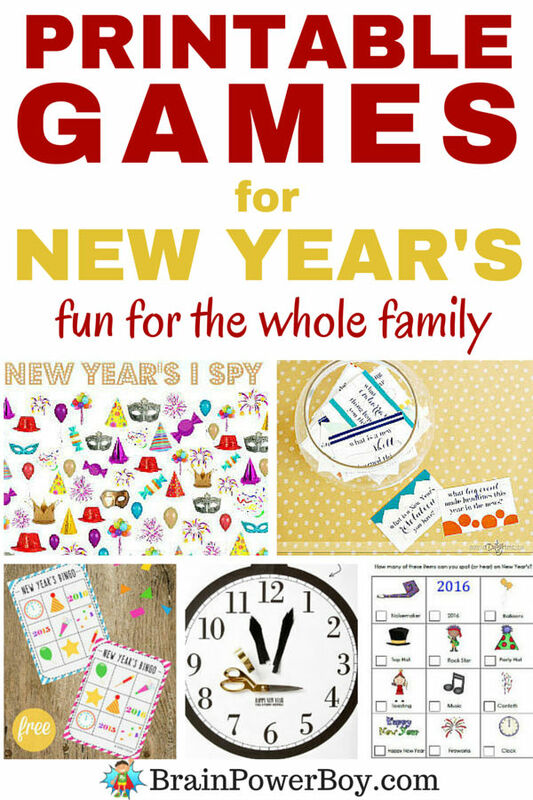 Here is a great selection of Printable Games for New Year’s. I really like free printables and these games are a lot of fun. I love the promise of a new year. Don’t you? A whole brand new year just waiting for adventures, memory making and fun. These games are a great way to get started. Play them on New Year’s eve or New Year’s Day. Enjoy! Be sure to see our other free printable games for more ideas. These games are fun for the whole family. Print out a few and give them a try. All of them are free printables, except the clock game. If you print it at the size they suggest you will need to take it to a print shop. This New Year’s I Spy Printable is wonderful. I love these games. There are items listed below the game board and you see how many you can find. Here is a New Year’s Eve Word Search. Perfect for passing the time before countdown. Find fun words such as midnight, hourglass, celebration and more. How about Bingo! That is always fun. This free printable New Year’s Bingo version is really cute. You need to plan ahead a bit for this game as you need to get it printed but it is a neat one. Pin the hands on the New Year’s Clock. Kids always enjoy scavenger hunts! Here is one that is perfect for ringing in the new year. Isn’t this a great selection of free printable New Year’s games? I am looking forward to printing some for us to play. I hope you enjoy them as well! Here are a few products I use when printing out games. You can just print and go if you wish. If I want to save the game and use it again, I print, laminate and cut to get a nice finished product. Click images to learn more . . . Try these New Year’s Eve Party Ideas for Kids for more fun ideas. This Goal Setting Article is a great read for starting the new year on the right foot. I wish you and yours the best in the new year!! My children love your activities. Super fun. Thank you for great pintables!! Wishing you and your family the best this new year!!! Paygyn, Thank you very much for your kind comment! I am so glad you enjoyed the printables. Wishing you and your family a wonderful year as well. I appreciate you taking the time to stop by and leave a comment. Yours was the first comment of 2019 and it made for a lovely start to my year.